Why we call it "EXPERIMENTAL". Landing gear is really simple when it comes to gyroplanes. Follow the kit or plans and you will not have any problems. Deviate or exceed your aircrafts gross weight and you will likely have some major issues to deal with. Gyroplane landing gear consists of bracing or a spring steel load carrying member, axle, wheels, rims, and brakes (if so equipped). Some mounting plates, fittings and maybe fairings may complete the landing gear assembly. As you can see gyroplanes do not have very complicated landing gear systems. No hydraulics, normally no retraction doors or servos. Simple effective fixed gear. 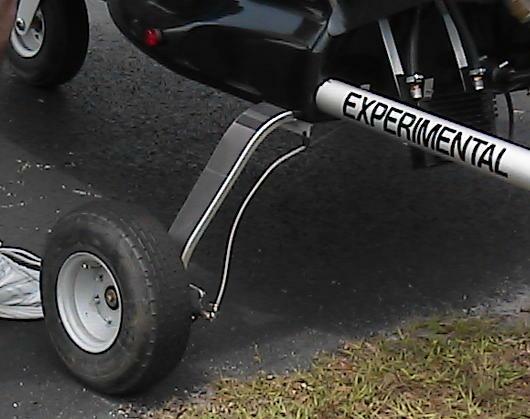 If you have a steerable nose wheel that works in conjunction with the rudder pay attention to the offset that should be put into the nose wheel for proper tracking down the runway. Your main wheels may also require a certain amount of camber or bend to help absorb landing loads and prevent early tire wear. Be sure to follow the procedures correctly to get your set-up right. Take note of the tire and tube sizes and retain in your records. One day you will need to change the rubber on the ship, so keep it handy. As simple as gyroplane landing gear systems may be Carter Technologies has taken a huge step forward in aircraft safety. They have designed, recieved patents, and tested a "Smart Strut" that can automatically control the compression rate of the strut up to 2,000 fpm. You can see the testing videos and see what this fantastic safety feature can provide, and remember this technology came from gyroplane research. Find out more by using the Carter Technologies Landing Gear Strut. Since we have covered a bit of ground now would be a good time to talk about Acft Corrosion Protection.